As RaceTrac Petroleum, Inc. continues to strategically develop sites throughout the State of Florida, the subject site was selected for their next state of the art service station and convenience store. 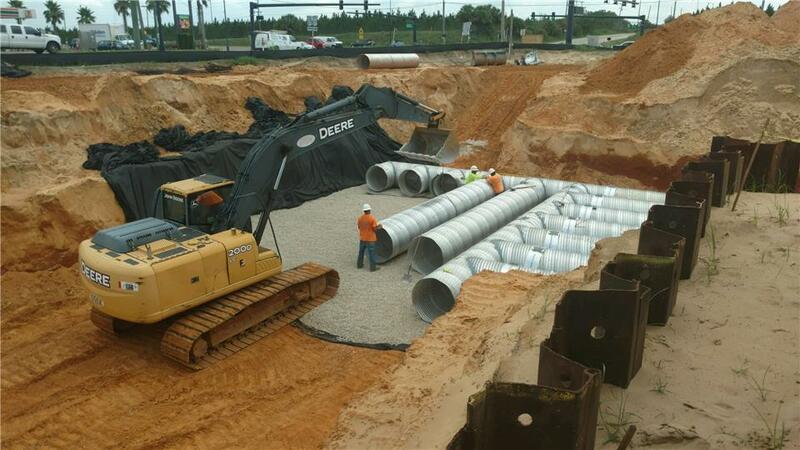 To address the stormwater management needs, the engineer evaluated several underground storage alternatives and selected a corrugated metal pipe (CMP) detention system from Contech Engineered Solutions based on its ability to meet the storage needs and overall value. The Contech solution consists of 2,943 LF of 42" perforated Aluminized Type 2 steel pipe constructed within a stone backfill to enhance storage capacity. The system is capable of storing 40,916 CF of runoff. The pipe is perforated to treat the water quality volume through percolation and promote groundwater recharge. While other systems are capable of satisfying these design objectives, the perforated CMP solution does so more efficiently and cost-effectively. Contech's CMP solution requires less minimum cover compared to many other proprietary systems, reducing the envelope of the system, and therefore, quantity of expensive stone backfill. The design flexibility available with our CMP system allows the specifying engineer to optimize their project’s vertical storage potential and deliver a more efficient and cost-effective solution for their client. For this project, the stone backfill surrounding our the CMP was limited to 3” above and below the pipe and extending 12” along the system perimeter. The ability to minimize the stone quantity along with the inherent cost-effectiveness of perforated CMP made Contech's solution the preferred solution for this project. During the design phase, Contech’s engineers assisted the Tannath design team in selecting a pipe diameter that best met their overall project needs. Once a pipe was selected, Contech engineers coordinated with the project engineer to integrate the CMP solution into the overall drainage design. They also supplied stage versus storage relationship data for use in their stormwater model and prepared site-specific layout and detailed drawings to support the engineer’s design documents. When it came to construction, time was of the essence. Contech’s sales representative discussed the contractor’s time constraints to understand how to best support their efforts. The project’s timeline presented extremely short fabrication times. When the dust settled, Contech’s local Pinellas Park manufacturing plant was able to fabricate and ship all of the components, including bands, fittings, access risers, pipe stubs, and geotextile a day ahead of the commitment date. 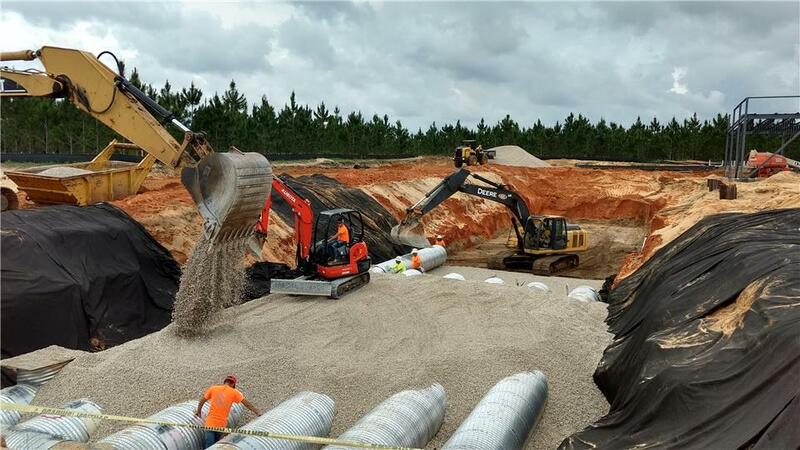 Following the installation, Alvin Mulford, Project Manager for Tiger Contracting stated, "We were pleased with our experience with Contech and their CMP system. The components were delivered on time and all the parts fit together well. We didn’t have any problems installing the system. It went in quickly, which helped our team stay on schedule."